This issue continues the Son Of Superman story arc, as the pre-Flashpoint Superman takes his son Jon on a ride-along while he attends to submarine in distress. However, the rather simple rescue is complicated by the sudden appearance of a mutated sea monster. Superman manages to turn this into a lesson for Jon on the use and control of his powers, by getting Jon to use his heat vision on the device controlling the monster. 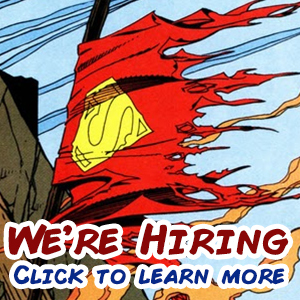 This is a painful lesson for Clark, as Jon’s uncontrolled heat vision proves strong enough to give Clark a nasty burn. After the crisis is averted, Clark and Jon take the time to have a father-son bonding conversation. First admitting to the thrill of Jon’s first superheroic outing, but quickly moving onto more serious topics. During the battle, we finally get to Jon in his superhero costume – mostly, as the cape has not been added yet. 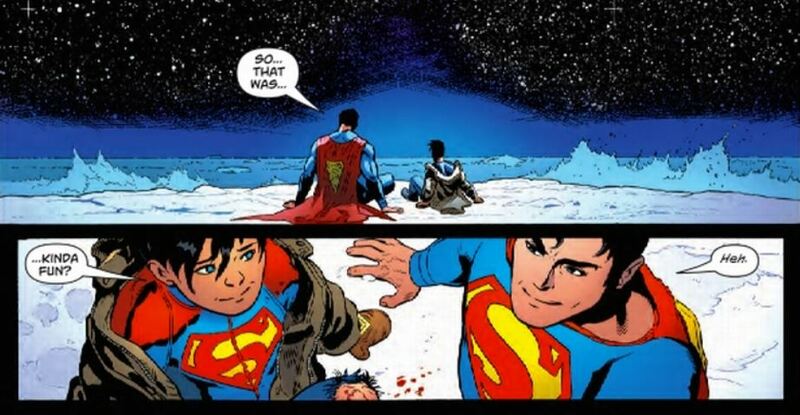 Clark asks if Jon is wearing it to declare himself as Superboy, but Jon merely wore it to be more like his father. This leads to a talk about what Superman “S” stands for, and Jon realizes that he needs to own up to his tragic mistake in the previous issue, where he accidentally killed the family cat while attempting to rescue it. After they depart, an unknown entity is shown finding some of Jon’s blood left behind from scraping a knee. This entity analyzes the blood to find that it is comes from a hybrid of Earthling and Kryptonian DNA, and that the Kryptonian half is from the House of El. Returning to their home, the Kents (or Smiths as they are now going by) hold a funeral for their pet, then Jon has a talk with Kathy, the neighbour that had witnessed last issue’s unfortunate accident. Jon is still in his Superboy shirt, so it appears that Kathy may be Jon’s equivalent of Lana Lang. There is even a hint of possible future romance. Unfortunately, another incident of causes Jon to fall out of a tree and suffer a slight concussion. This raises the puzzling question of how, with his powers, he can still get scraped knees and a concussion. Then we are given a short look ahead at the next threat the family is to face – a character that long time Superman readers will recognize instantly. 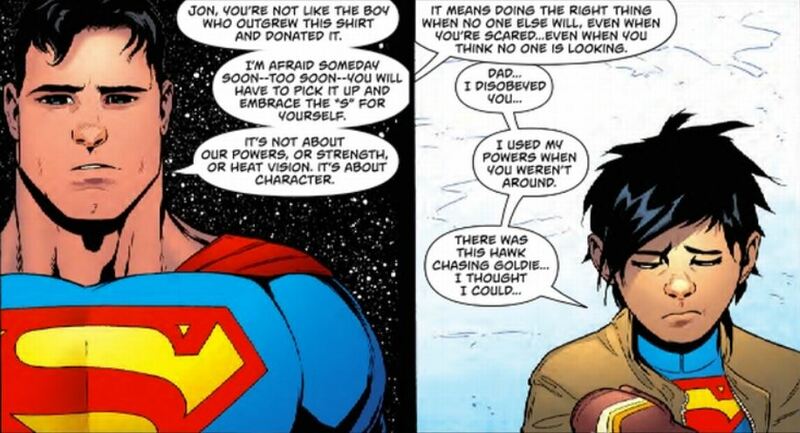 I am really enjoying this look at Superman as a family man. He is using his own experience of growing up with powers to guide his son. Both he and Lois are shaping up to be good and caring parents. There is also a blink-and-you’ll-miss-it hint at future happenings that raises a lot of questions. 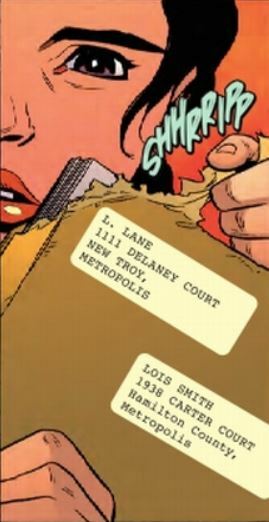 Lois is shown receiving a package in the mail from an L. Lane in Metropolis. Has Lois been in contact with this world’s Lois? Or has this world’s Lois found out about her and tracked her down? Or is L. Lane actually Lucy Lane? Does it signify anything that the package is addressed to Lois Smith rather than her pseudonym “Author X”? As with the first issue, I can’t find much fault with the story. The only thing is Clark’s treatment of the neighbour that brings the injured Jon home to his parents seems overly harsh. I understand that Clark is protective of Jon, and is needing to keep Jon’s powers and alien heritage secret, but he could have handled. Someone with Clark’s long experience with stressful situations should have allowed him to act in a calmer, more reasonable fashion. Even Lois seems to notice that this is out of character for Clark. Once again, this is a very solid issue, and I am enjoying seeing Superman guiding his son as he takes his first steps towards being a superhero. 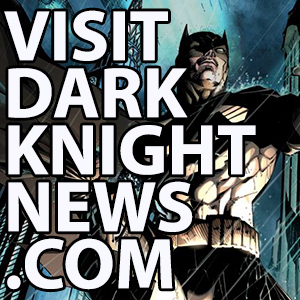 This issue is branded as part of DC Rebirth, and we continue to see DC fulfilling the commitment to returning the spirit of the pre-Flashpoint era while continuing to move forward in new directions. 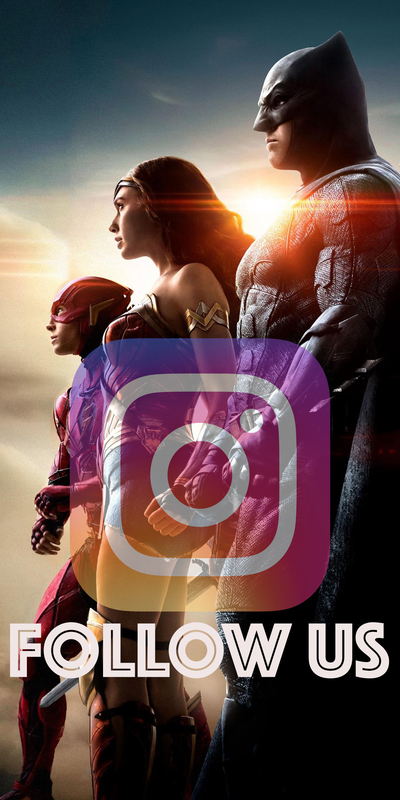 What could better exemplify this than the pre-Flashpoint Superman training his son as he moves toward becoming the new Superboy?